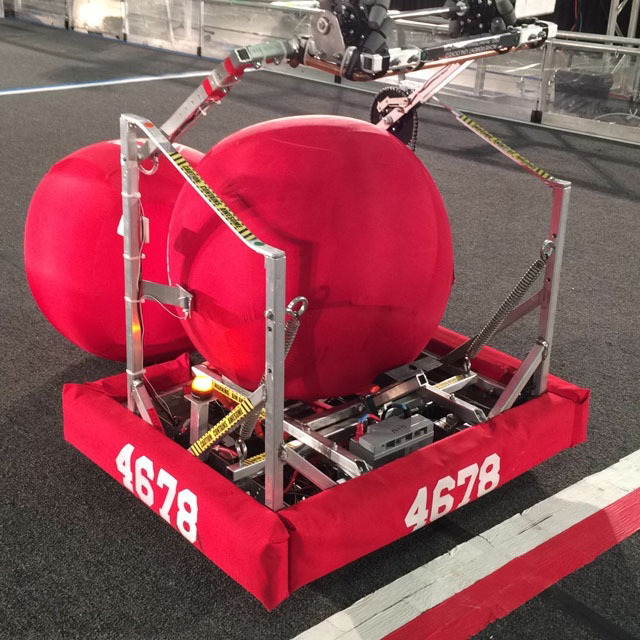 2014 Aerial Assist Robot "GLaDOS"
Two ball hot goal: GLaDOS would be preloaded with one ball. At the start of autonomous, GLaDOS detects the lit up hot goal and rolls forward on an arc and fires. 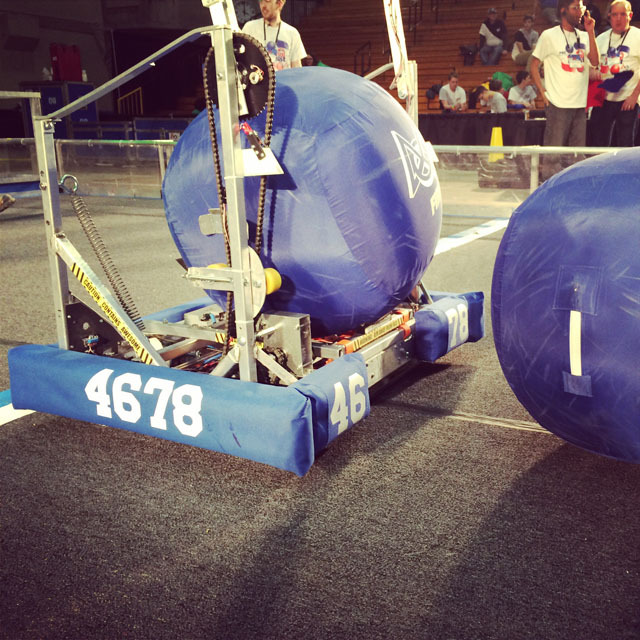 It then backs up and picks up the second ball that was positioned immediately behind the robot at start up. The second ball is picked up, and second hot goal detected. GLaDOS rolls on an arc again toward that goal and fires the second ball to score. GLaDOS was quite underweight, so a 18"x18"x1/4" steel plate was affixed to the bottom to bring its weight up and prevent the robot from being pushed around. Final weight of GLaDOS was 117lbs. We noticed the ball diameters varied due to over- or under-inflation. The shape of the ball wasn't always perfect, either. GLaDOS has potentiometer sensors that measure the ball when the pick up arm is dropped on a ball. Once measured, the pickup applies an optimal amount of pressure on the ball to friction load the ball into itself. Due to the full contact nature of the 2014 game, many repairs were made in the pits including replacement of shooter axle between semi-final matches in Windsor. With the combined effort of the pit crew, it took less than 6 minutes to get repaired!